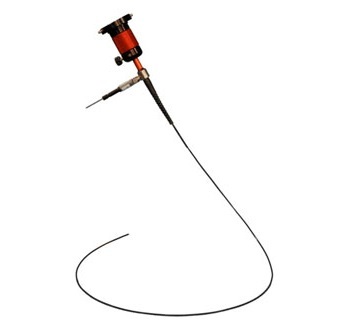 Machida’s smallest body type, these borescopes are available in diameters as small as 0.6mm up to 2.0mm in diameter. Four semi-flexible probe models and five flexible probe models are available. They are versatile, field replaceable, and economical. Semi-flexible fiber probes are available in 60cm working lengths and flexible fiber probes are available in 30cm. Additional lengths are available on a special order basis. Views range from 60° to 70° and come in direct and right. Small diameter modular borescope system consists of: fiber probe, ocular piece (EP-D2), light guide cable (LG-D), and sleeve. Light source is necessary and purchased separately. A carrying case is included with a complete set order of a fiber probe, ocular piece, and light guide cable. A Carrying Case is included with a complete set order of a Fiber Probe, Ocular Piece, and Light Guide Cable.